Policosanol (CH3-(CH2)n-CH2OH), is a mixture of medium to long chain fatty alcohols with chain lengths varying between 24 to 34 carbon atoms, extracted from natural sugar cane wax. Policosanol mixture consists of Octacosanol (C28H58O), hexacosanol (C26H54O) and triacontanol (C30H62O). 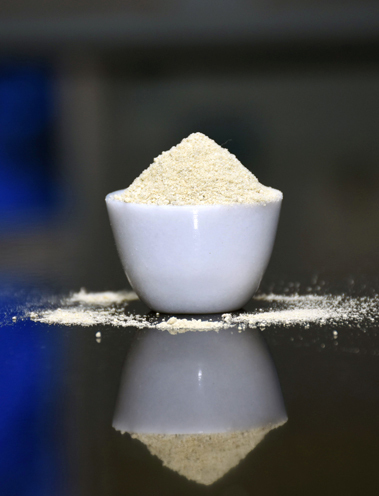 Policosanol is widely used in functional foods and various types of nutritious products. Policosanol helps lower the levels of low-density-lipoprotein (LDL) cholesterol and total cholesterol while it increases levels of high-density-lipoprotein (HDL) cholesterol. Policosanol is a natural, safe alternative to statins with no adverse side effects. For this reason Policosanol is thus a phytochemical alternative to the classic lipid lowering drugs like statins. Policosanol is available from natural sources such as from sugar cane, beeswax, and kernels of cereal grains. Natural sugar cane policosanol is reported to be the efficient among different varieties and the mixture consists of Octacosanol (C28H58O:60-65%), hexacosanol (C26H54O: 6-7%), triacontanol (C30H62O:12%) and 15% of eicosanol, nonacosanol, dotriacontanol, tetratriacontanol and heptacosanol. The sugarcane policosanol is identified to be possess higher pharmacological activity. The exact working mechanism that is responsible for policosanol’s positive effects on cholesterol levels is not clear. However, it is reported to inhibit cholesterol synthesis in one of its earliest stages. Policosanol appears to influence expression of HMG-CoA-reductase and reduces synthesis of this enzyme. Other possible mechanisms include increased uptake of LDL cholesterol by liver and the inhibition of cholesterol and bile acid reabsorption in the intestine. Policosanol is identified to negatively incluence the blood platelet aggregation. This effect also improves symptoms of intermittent claudication. Inhibition of inflammatory mediators like thromboxane B2 appears to be the mechanism responsible for platelet aggregation. This makes blood platelets less ‘sticky’ reducing the tendency of blood to coagulate. In vitro, policosanol is shown to counteract LDL-oxidation. Oxidation of LDL cholesterol is a crucial step in the formation of plaques. The proliferation of smooth muscle cells is yet another important step in the formation of atherosclerotic plaques. Policosanol has been shown to have a more effective capacity to inhibit this process. The molecule is used in treatment of high blood calcium induced osteoporosis. Unlike cholesterol-lowering drugs that can induce impotency, policosanol is suspected to have a libido-enhancing effect. Policosanol helps reduce systolic blood pressure and improve basal metabolic rate. The molecule also improves smooth muscle cell proliferation and hence perevents and reverses atherosclerotic lesion and thrombosis. Policosanol is effective in a wide range of patients with diabetes, lower cholesterol levels, liver dysfunction, high blood pressure and other risk factors for heart disease. Policosanol is exceptionally safe. The molecule possesses no mutagenic and carcinogenic effect. This is reported to neither alter fertility and reproduction. Oral policosanol supplementation at 5 -10 mg twice a day is ideal for treatment of hypercholesterolemia. However, the product should be consumed only under strict medical prescription. In general, oral supplementation of policosanol is well-tolerated. In some patients it can cause erythema, migraines, insomnia, somnolence, irritability, dizziness, upset stomach, polyphagia, dysuria, weight loss, skin rash, and nose and gum bleeding.